Elegance and refinement get a gorgeous showcase in this 4-piece curtain set with two blackout panels and two tulle curtains. The thick, colorful fabric hangs gracefully, keeping the sun out and reducing noise for a peaceful home environment, while the tulle brushes daintily against the panels, a wonderfully luminous juxtaposition. Please note: There is a 1/2-inch allowance in length of panels. I read the reviews before I purchased. 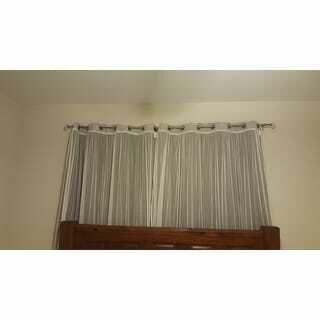 Many reviews said how elegant and beautiful these curtains were. I ordered EIGHT sets! The sheer cover had a slight smell when opened. I washed these curtains on hand wash cycle and threw them in the dryer low heat. The inner color curtain panel came out of the dryer nearly wrinkle free! So did the sheer curtains! The grommets are sliver. I hung them all up and they are exactly what you see in the picture! It does look elegant!! A very very good buy! If you are looking at them and considering buying, don't hesitate, BUY THEM! You will not be disappointed! Oh! And where the curtains fold at the top, where the grommets are, they pleat perfectly! Love, love, love these. They have a great look being very filmy, but with color behind them. Be aware though that they are NOT sewn together as I thought, but come as two block out curtains and two white sheers. 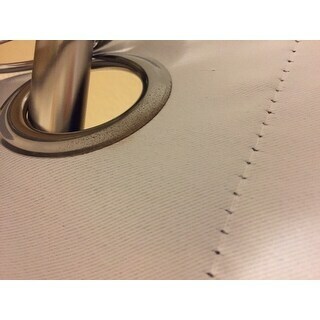 You put the grommet holes together at the top and thread them onto one curtain pole to get the look. So you ARE getting four separate curtain panels, but it's really one set of two panels based on the look as shown. The write up needs to be clarified to say that the four panels you get are two single black out panels and two single sheers. These curtains will add an elegant and finished look to your decor. The curtains are exactly as pictured. 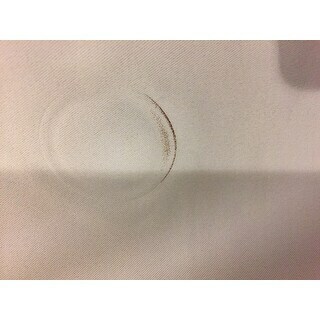 The material is soft and strong. You will love your purchase of this pair. And yes they are 100% light blockage, however, I have a perforated type window shade behind the curtains for added insulation. 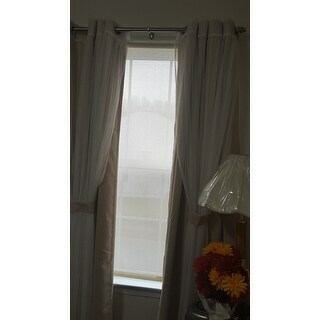 Aurora Home Mix and Match Blackout Tulle Lace Sheer 4 piece Curtain Panel Set Set gave me the privacy we need, with the sheer curtain on top to look nice. The package comes with two panels of the blackout curtain and two panels of the sheer curtain, making this a very affordable purchase. The grey is a very light grey, almost an off-white, and it blends beautifully if you have white walls. 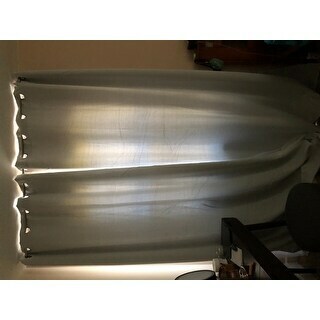 I purchased two of the dark gray blackout curtains with the sheer tulle 4-piece panel sets for my bedroom. They look and work great! 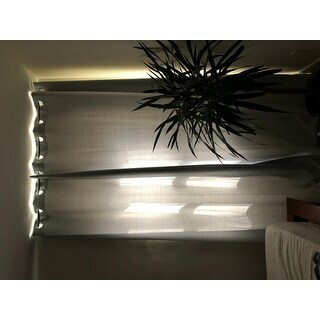 The blackout curtains work perfectly with no light coming thru and will also help keep the heat out in the summer and the cold out in the winter months I am sure. I really love the tulle feature over top as it adds nice texture, airy and romantic feel to the space. I would definitely recommend these and was very pleased with the quick delivery. I did try to run the curtains in the dryer with a damp towel as the instructions recommended to get the creases out unfortunately it did not help much but I did use Low Heat because I was scared to use medium or high heat since the curtains have the plastic/metal grommets. So I just used my handheld steamer to get the creases out...that took some time but overall it worked and I am happy with my purchase. I wanted a blackout curtain that had a soft, feminine appearance. I saw these, and knew they were the ones. I am very pleased. They are truly blackout. When turning out the lights at night, I can't see my hand in front of my face. In the daytime, they are a beautiful accent to my bedroom. They are good quality as well. Remember, they have grommets on top, so if you want a really dark room, get the longest curtains and hang them high up. I bought these drapes in violet/lilac for my master bedroom. I was afraid that the lace sheer was going to be to feminine for a master bedroom. Two features kept bringing me back to look at them. They came up in my search because they had blackout panels. My Golden Retreiver sleeps with me and at the first sight of light she is positive that it is breakfast time. I don’t agree. More importantly I finally understood what decorators meant about adding texture. The lace sheer was exactly the added texture that I needed as were the silver grommets. I am very happy with the purchase. The violet/lilac and lace panels were perfect against my charcoal walls. I have since sold my house but will be buying more for the new house. I was referred by my friends and know overstock website. 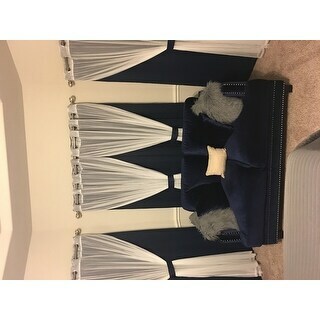 I compared the same curtain from different retailers and found the price and quality of the same curtain in overstock is the best.The item was delivered on expected time. 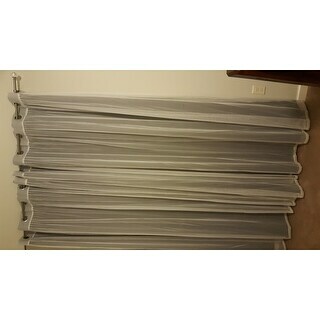 The quality is very good including 4 pieces of panels. I like the Tiffany blue color blackouts. The size of the panels fits the description. I will definitely continue shopping in this website. I cannot express how impressed I was with these curtains! 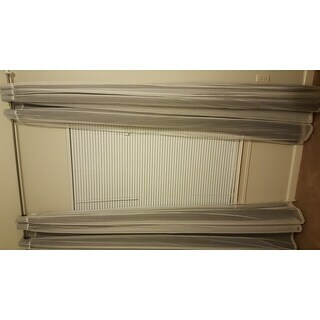 I thought for the price and a total of FOUR curtains in a set that it was too good to be true! But nope, they’re exactly the look I had hoped for and exceeded my expectations! They have a feminine look because of the sheer overlay but the blackout curtain (beige) keeps light out at night from traffic on the street. I do have blinds as well but now with the curtains have zero light shining in! And they drape and flow beautifully closed and open during the day! I will purchase more for my other rooms! I wish I had came across these sooner! It takes a lot to impress me but whoever thought of these was a genius! Most blackout curtains are far from feminine looking! They look perfect with my farmhouse decor! Also, the black out curtain material has a soft almost velvet feel which is nice as well. These curtains are not even close to being black out. Light comes through, even indirect light. Was I sent the wrong thing? A set of these came with rusted grommets, and stains on the curtain from them. They look and feel cheap to me. Vapor color is almost a stark white, which I’m not crazy about. This is my 5th time writing the review because Overstock is having an “issue” letting me upload this while it has no problems with my other good reviews. Beautiful curtain ! The color vapor is a VERY PALE GRAY ALMOST LOOKS WHITE. Love,love, love these beautiful curtains. They are so worth it couldn't be more pleased. I can't tell you how many curtains I have purchased from other places, that I have had to return. These hang and fall to the floor so graceful and they are true to color. Thank you so much overstock.com. Will be ordering more for my bedroom. What else can I say, very happy and pleased customers. Very elegant curtains. I like the option of pairing the tulle with the solid curtain. It's also very effective at blocking out the sunlight. 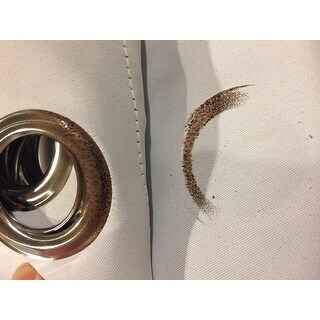 I got first one in light pink color then I liked it so much got another one in gray color its nice reverse look. 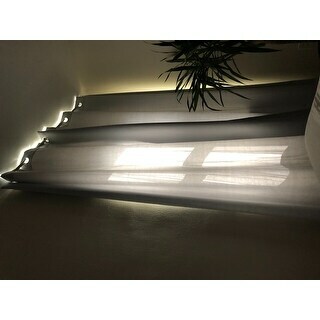 sheer goes in front of the curtain, gives nice protection from sun light. These could have gone either way......chintzy or elegant. They went the right way. Well made and elegant. These curtains are just as described! I was scared the sheer panels would make them look old lady-ish but look great once ironed and hung. I have them 4 stars instead of 5 because I’m not entirely sure they’re the best blackout shades. I’m not super picky about light while sleeping but if you are, probably go with a darker version. "is the width measurement per panel or per set?" Each panel is 52 inches wide. "Will the beige or wheat color ever be restocked in the 96 inches?" Unfortunately we don't have any plans on restocking this. The Vapor option is an off-white tone. It looked more of a very light grey color to me. 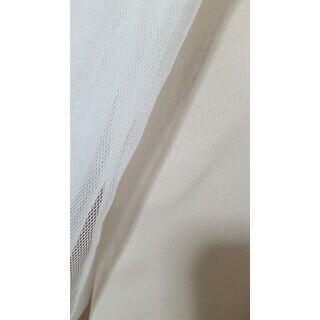 It's white sheer over light gray, its a very light gray. "Are the blackout and tulle curtains fire retardant??" "Can you change out the grommets?" "This was my question: "If I wanted to buy just a set of sheers to put in the center of the beautiful panels, could I get a set of sheers by themselves?" 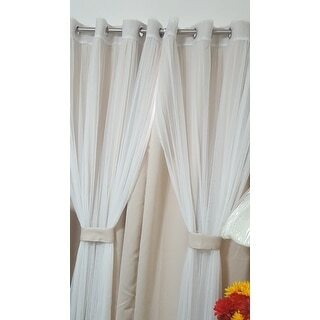 What I wanted to know, does Overstock sell Sheers like these so they can go on the same curtain rod? Thank you. I like some sheers when I open the drapes, so there is some privacy. I don't like blinds etc." Unfortunately, these sheer panels only come in a set. For further options on sheer panels, please input 'sheer curtain panels' into the search bar.